Moderator Anne Kavanaugh (left) and panelists prepare for the discussion. SPJ DePaul’s Freedom of Information Panel discussion on Thursday offered tips on using FOIA requests and insight to how investigative journalists work. 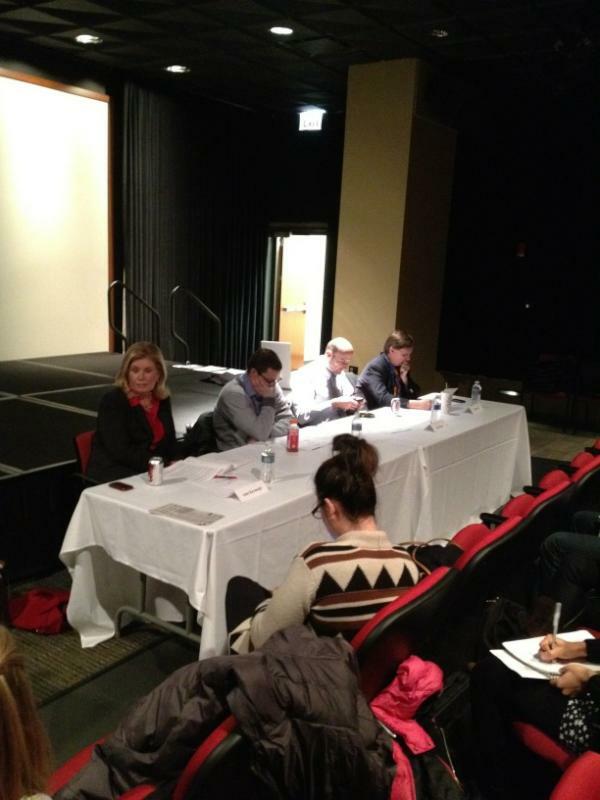 The two-hour panel, moderated by DePaul adjunct journalism instructor and former TV news reporter Anne Kavanaugh, featured panelists Tim Novak and Chris Fusco of the Chicago Sun-Times and Mick Dumke of the Chicago Reader. The free event drew nearly 50 people to the basement theater at DePaul’s Daley Building, 14 E. Jackson Blvd. Miss the event? Craig Newman of the Chicago Sun-Times archived live-tweets and background in a Storify.